Cryogels have recently appeared as a new class of materials with combination of unique properties. Highly porous polymeric materials with a broad variety of morphologies can be produced from practically any gel-forming precursors via cryotropic gelation. Protista Biotechnology has chosen to call its cryogels. Cryogel monoliths (i.e. prepared as one piece columns) are the novel supermacroporous stationary media designed for processing the particulate containing fluids as crude cell homogenates, virus- and cell- suspensions. Cryogel monoliths are characterised by having the system of large (10-200 μm) interconnected macropores and sponge-like morphology. 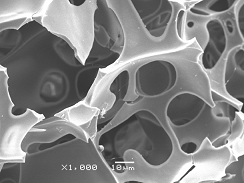 Cryogel monoliths are mechanically strong, but non-brittle due to the elasticity of the polymer walls in between the macropores. Cryogels produced from for example polyacrylamide and poly(vinyl alcohol) have very good osmotic stability. They do not swell or shrink in response to changes in pH or ionic strength, are chemically stable and are resistant in microbiological attacks. Cryogel monolith columns are functionalised with different ligands for affinity, ion-exchange, metal-affinity and hydrophobic chromatography. call +46 (0) 42 829 10.